If you google “modern cotton slavery” phrase you would immediately understand what a country will be discussed. These words are tightly connected with Uzbekistan. Although, how much tightly? With the change of the head of state, the population of this country and civil society has had a weak hope of getting rid of the long-term cotton slavery. And while in autumn 2016 the situation in the cotton industry has not changed much, but human rights activists do not give up hope. Again and again, they try to draw the attention of the world community as a whole and of the World Bank which pursues its interests in this country, in particular, to this one of the major problems of Uzbekistan. “We can’t refuse to pick cotton. Forced and Child Labor Linked to World Bank Group Investments in Uzbekistan” is the name of the report prepared by Human Rights Watch (HRW) and the Uzbek-German Forum for Human Rights (UGF) published on 27 June 2017. It describes how, in 2015 and 2016, Uzbek authorities forced students, recipients of public sector workers and private sector workers to weed cotton fields and pick cotton. People forced to pick cotton and denied payment for their work. The report was based on interviews with people affected by forced labour in September-November 2015, April-June and September-November 2016 and early 2017, as well as statements by officials and official documents that acquired by human rights defenders. The report documents the use of forced labour of adults and children in only one region of Uzbekistan where a World Bank project is being implemented, and it is highly probable that other World Bank agricultural projects in this country may also be linked to forced labour because these violations are systematic. 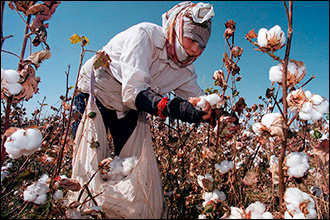 The authors of the report remind that due to the use of forced and child labour in the cotton sector of Uzbekistan 274 companies boycott Uzbek cotton. Despite this, the World Bank remains active in the agricultural sector of the country and he allocated loans totalling $18.75 million to the Uzbek government for projects in this sector in 2015-2016. Since April 2015, the World Bank has been working with Uzbekistan in the framework of an irrigation project worth $337.43 million in Turtkul, Beruni and Ellikkala districts of Karakalpakstan where cotton is grown on more than 50 percent of arable land. Uzbekistan has pledged the World Bank to its obligation to observe norms of national and international law concerning forced and child labour in the project area. The bank group said that if there is reliable evidence of violations of this pledge, the loan may be suspended. However, the Uzbek authorities did not stop using forced and sometimes child labour in the cotton sector in the Turtkul, Beruni and Ellikkala districts, including the project implementation area. Independent organisations repeatedly conveyed an evidence of Uzbekistan's violation of its obligations to the World Bank in 2015. But instead of suspending the loan to the government in accordance with the agreement of 2014 between the parties the World Bank increased investments in Uzbekistan's agriculture through its private sector lending unit, the International Finance Corporation (IFC). In particular, in December 2015, IFC approved the granting of an $40 million credit to the Uzbek-Indonesian Indorama Kokand Textile Corporation, the leading producer of cotton yarn in Uzbekistan, to expand the textile factory where only Uzbek cotton is used for production. The corporation assured IFC that it is monitoring the purchased raw materials from the picking site for the use of forced labour of children and adults, and developed a system for assessing the level of risks in the areas where the cotton ginning plants are located. However, this system does not stand any criticism, human rights activists say. The World Bank also actively finances the country's educational sector, despite the fact that teachers and students, including children, are forced to leave to work in the cotton fields for several months. Through direct financial injections as well as through the Global Partnership for Education - a multi-faceted financing platform - the World Bank allocates nearly $100 million for educational projects in Uzbekistan. Since 2013, the authorities of Uzbekistan have significantly reduced the number of children forced to work due to the mobilisation of more adults than before. Nevertheless, in 2016 HRW and UGF documented more cases of child labour organised by the state than a year before. In 2013, people who were forced by the Uzbek authorities to participate in cotton harvesting, complained to the Inspection Board, an independent mechanism for ensuring the accountability of the World Bank, about the World Bank agricultural project helped preserve the system of forced and child labour in Uzbekistan. In response, the World Bank obliged the Uzbek government to comply with the norms of national and international law governing forced and child labour. The bank promised to provide independent monitoring of work practices in the regions where the bank's projects are implemented and to introduce a mechanism to address complaints of victims of forced labour. According to human rights activists, such measures on reducing risks are not able to properly solve the problem of systematic forced labour in the cotton sector of Uzbekistan organised at the state level. In the end, the bank group realised that it can not fulfil some of its obligations. But instead of conducting an independent monitoring of the use of forced and child labour it has signed an agreement with the International Labour Organisation (ILO) on conducting such monitoring jointly with the government of Uzbekistan. The joint report of the HRW and UGF states that Uzbekistan does not have a proper complaint mechanism, in 2015-2016 independent observers, human rights activists and journalists constantly faced with the threat of persecution and harassment. HRW and other organisations have repeatedly recommended that the bank include a separate article in the loan agreements providing for unhindered access for representatives of civil society and journalists to monitoring the use of forced and child labour and other human rights violations in the project area of the bank group, as well as to prohibit reprisals against observers, their interlocutors and people complaining. The World Bank refused. Changing the president of Uzbekistan is a convenient time to demand comprehensive reforms aimed at eradicating all forms of forced labour and bringing those responsible for past violations to justice. However, Shavkat Mirziyoyev's promises are not very trustworthy: as prime minister from 2003 to 2016 he oversaw the production of cotton, and before that, as a governor, he headed two cotton-growing regions, the Djizak and Samarkand regions. In 2016, when Mirziyoyev was acting president, the collection of cotton was still marked by massive forced mobilisation of people under a threat of punishment. Human rights defenders are sure that the government of Uzbekistan could carry out urgent reforms thereby demonstrating its commitment to the goal of ending the problem of forced labour. It is necessary to observe and enforce laws prohibiting the use of forced and child labour; instruct all authorities on termination to forcefully mobilise people for work; allow independent journalists and human rights activists to freely monitor the cotton industry without fear of reprisals. The World Bank, in turn, should suspend agricultural and irrigation financing of Uzbekistan until the government fulfils its promise not to use forced and child labour in the areas of projects supported by the bank. IFC should suspend investments in the cotton industry of Uzbekistan until its borrowers demonstrate that they are supplying cotton harvested without the use of forced and child labour. In addition, the World Bank and IFC must take all necessary measures to prevent reprisals against observers who document and cover working conditions and other human rights problems directly or indirectly related to their projects in Uzbekistan. These financial institutions should closely monitor cases of repression, and promptly, publicly and actively respond to them. They should independently investigate alleged violations and work on the procedure for compensation for harm caused by repression. In addition, the World Bank should amend the project agreements on Uzbekistan to require the government to allow independent journalists, human rights defenders and other citizens and the organisations to monitor and report cases of forced and child labour and other human rights violations in all areas of the World Bank Group's projects. Under the agreements, the bank should also get guarantees from the government that no one will suffer repression for monitoring human rights violations in project implementation areas, for filing complaints and communicating with observers. The full text of the “We can’t refuse to pick cotton. Forced and Child Labor Linked to World Bank Group Investments in Uzbekistan” report with a list of recommendations of human rights defenders can be found by following this link.